These cinnamon tea recipes are sure to hit the spot. Whether you’re looking for the pure, spicy taste of just cinnamon or want a tea that blends the deliciousness of cinnamon with other yummy flavors, you’ll find the comfort you crave with these recipes. And don’t worry about having to search all over town for ingredients! 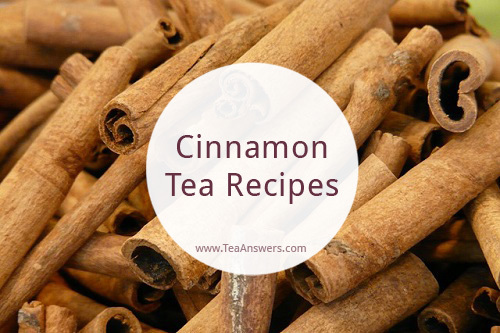 All of these recipes for cinnamon tea can be made with ground cinnamon or cinnamon sticks. Add the cinnamon stick or ground cinnamon to your cup. Let the cinnamon tea steep for 8-10 minutes. Add any optional sweetener or milk (honey is especially good with cinnamon). Let steep for 2-3 minutes. Strain the tea into your cup. Add any optional sweetener or milk. Cinnamon Citrus Tea: Add lemon, orange or lime juice. Just be careful if you add milk because it may curdle. Cinnamon Ginger Cold and Flu Fighter: Add 1 tablespoon fresh ginger or 1 teaspoon ground ginger. The combination of cinnamon and ginger is a lovely traditional remedy for sore throats, coughs, colds, and the flu. Cinnamon Tea for Weight Loss: Sweeten your tea with stevia. Naturally low in calories, stevia is the perfect compliment to cinnamon, whose reputation as a weight loss aid is growing.